Do you want to “Rock the Reception”? You’ve planned all the other aspects of the event down to the tiniest detail. Everything is going to be perfect, exactly as you’ve dreamed. Why not make your first dance perfect too? Learn to dance now, so when the big day comes, you will feel prepared and confident and relaxed as you sway elegantly with your partner in front of your friends and family. Dance lessons are something that need to be planned in advance, like booking the DJ and ordering the cake. They are a great way for the bride and groom to spend time together learning something new, or to bring the families and wedding party together. Even if you have no dance experience whatsoever, we can give you the basic skills and moves to look competent and confident on the floor. Your friends and family will be impressed to tears! Which style of dance can we learn? The most practical and ideal dance for weddings is called NightClub Two-Step, which is an easy to learn, elegant yet relaxed, impressive looking partner dance. Other dances are available such as Waltz, Swing, or Salsa, which you may be interested in continuing after the wedding is over. We will teach you a variety of camera-friendly romantic moves, including a dip, that are mix-and-matchable so there is no choreography to memorize. We have a song we consider “our song” can you teach us to dance to that? Yes, depending on what the song is. The genre of song will determine which dance we teach you. We can also edit your song to make it shorter, longer, faster, or slower. If your song is not good for dancing, you can always use it for the bridal procession or during a slideshow and pick a different song to dance to. We’re pretty traditional – we’d like to dance a Waltz. Can you teach us that? Yes, absolutely. But because the rhythm of Waltz is 3/4 time, it is harder to find a ballad (slow song) to choose for “your song” which you can dance Waltz to. If you are hiring a string quartet or pianist to play classical music, you can ask them to play a waltz for you. However, we have a beautiful waltz alternative that has the same elegant flow but can be done to songs in 4/4 time. How much time do we need to plan to take the lessons? 95% of couples say they wish they had planned to start their dance lessons sooner. Give yourself at least 6 weeks of lead time before the wedding date. You’ll want to take one or two lessons per week, (and remember to practice between lessons). Then, if you have to reschedule a lesson, you won’t run out of time. Since the goal is to be confident and competent on the floor, we recommend a minimum of 6 one-hour lessons. Most couples take one or two lessons per week for 6-8 weeks before the wedding date. These are private or semi-private lessons in our studio. You decide if you would like just the bride and groom to dance at the reception, or if there will be a dance for the bride & father, groom & mother, etc. 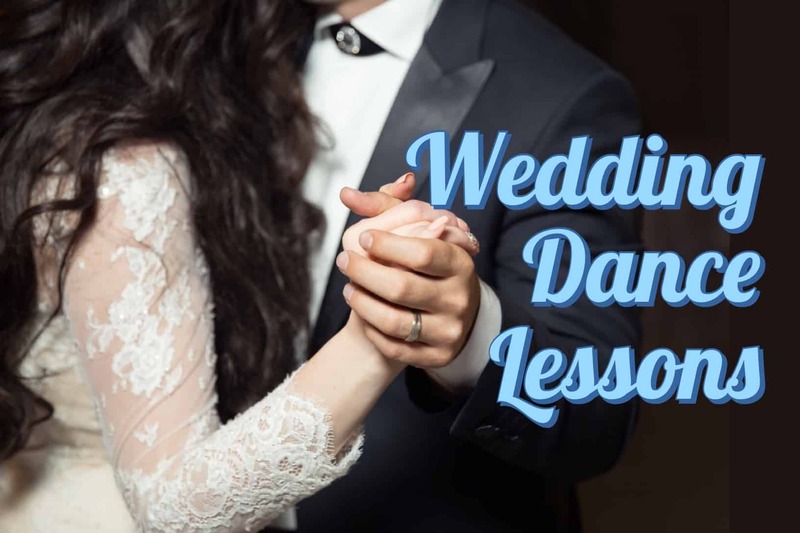 You may want to include the wedding party in your lessons as a bonding opportunity, or learn one dance with the wedding party and keep another dance style for your own song. Do I have to buy a package? Can I just buy a single dance lesson? Yes, we can do single lessons a la carte. But we HIGHLY recommend a package of at least 6 lessons, because in our experience, most couples only start to feel really comfortable and confident with their dance after 5 or 6 lessons. Couples who only take one lesson are usually those who have already learned how to dance elsewhere and they just need a tune up or a few new moves for the photographer. We have found that couples who are new to dancing and only take one lesson do not retain enough to use what they learned when it comes time for their dance. They still feel awkward when it comes time for the reception and don’t retain enough to actually use the moves they learn in the spotlight. The studio is large, modern, and elegant. There will be several other dancers in the studio taking their own private lessons with other teachers. There will be music playing intermittently. You will sit down with either Myles or Tessa and discuss your song choice, the style of dance we recommend, what kind of performance you envision for the reception, and any dance, music, or sports experience you might have already. Then we’ll get you moving to the music and teach you how to move together as a partnership. After each lesson, you are welcome and encouraged to stay and practice. Each lesson we will review and build on skills, so by the time of the wedding you will feel confident, relaxed, and photo-ready. Here’s a little video clip of one of our wedding couples on their 4th lesson in our beautiful studio. Get started ASAP, so you have lots of time to practice and can avoid additional stress of “cramming” at the last minute! Package OR deposit must be paid in advance.